Many people would like the freedom of travelling on their own but don’t feel comfortable exploring Africa solo off the beaten track. Travelling in a group can give you a false sense of security and if you are cautious and keep a few basics in mind, there is no reason why you cannot travel Africa in one vehicle. Group travel may provide you with enjoyable company but can jeopardise your independence and spoil your trip if you have to continuously compromise on routes, the schedule, places you wish to visit and things you want to do. After our solo return trip from Cape Town to Ethiopia we still prefer travelling on our own, simply because that gives us the freedom to plan our route and stay-overs the way we enjoy them, even to the point where, once on the road for the day, we can easily deviate from our plan. There is virtually no unexplored country remaining in Africa, most areas are highly populated and roads, tracks and footpaths abound. So whilst it’s true that ‘all roads will eventually lead to home’, it helps to know where you are and which route will best get you to your destination. If you are going off the beaten track then be sure to have all available maps: paper maps, Open Street Maps on your electronic device and off course the available Tracks4Africa maps on paper, your tablet/iPad/smartphone and your GPS. No map can be perfect as things change all the time, so the more information you have, the better, even if they just provide you with the names of villages ahead. Armed with these, you can usually get directions from the locals. You will also need a good sense of direction as you should always ‘second guess’ your GPS and make sure that it is indeed taking you in your intended direction. Being able to determine north from the position of the sun is a good start, but remember to take a little more care north of the equator. If you do an overland trip you will have to be self-sufficient. Always carry enough surplus water and food for a week and be prepared to be severely inconvenienced if you get stuck or break down. Don’t rely on a satellite phone to get you out of trouble in far off places unless you have pre-arranged some form of support (just about impossible in Africa). 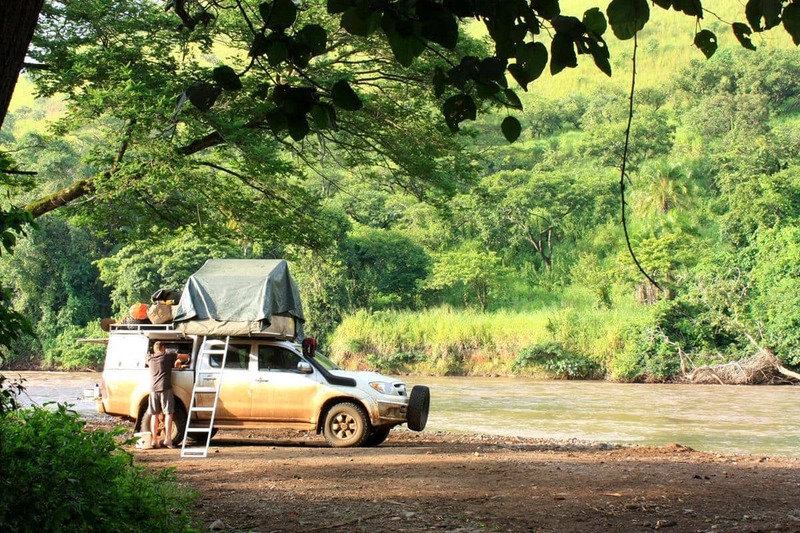 There are many established campsites, lodgings and overland hubs in Africa but if you have a sense of adventure and want to go off the beaten track you have to be prepared to rough it. Distances between established campsites are often large and the routes slow due to road conditions. As it is not advisable to drive at night in Africa, mostly because of animals and people, you will often have to be prepared to stay overnight out of an existing camp. You must be prepared to rough it. Camping near villages in remote areas provides an opportunity to experience the culture of the rural people who are usually friendly and accommodating. If you can speak the local language or find someone who can speak English, you should ask for the chief or headman. He may well grant you permission to camp in or near the village, provide security and keep inquisitive children away for a fee. 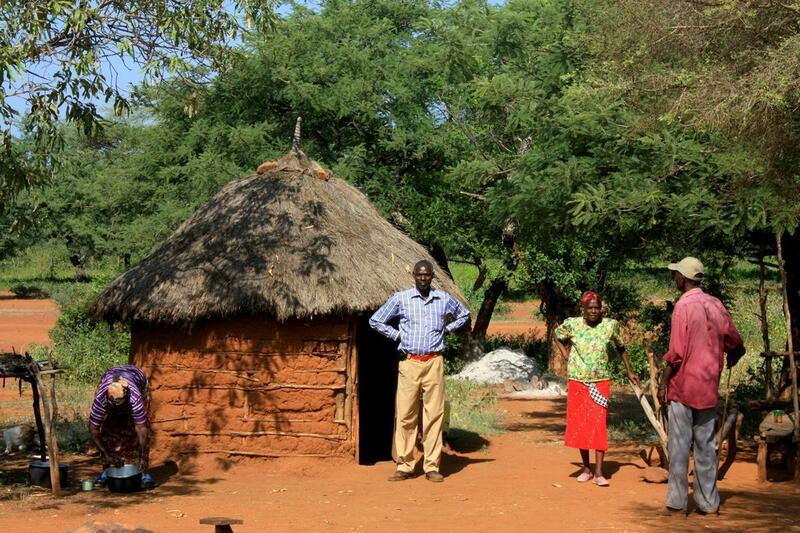 Villagers may even provide firewood and activities like mokoro trips or village walks. However, don’t camp near a village without asking permission as the people might treat you as a potential threat or target. Always ask permission from the chief or headman if you want to camp near a village. If you really want to explore the backwoods and experience the ambiance of the African bush, you should be prepared to bush camp. This is an amazing experience – one that we have come to prefer to formal camping – and it gives you great freedom to go where you wish without being bound by the availability of suitable accommodation. 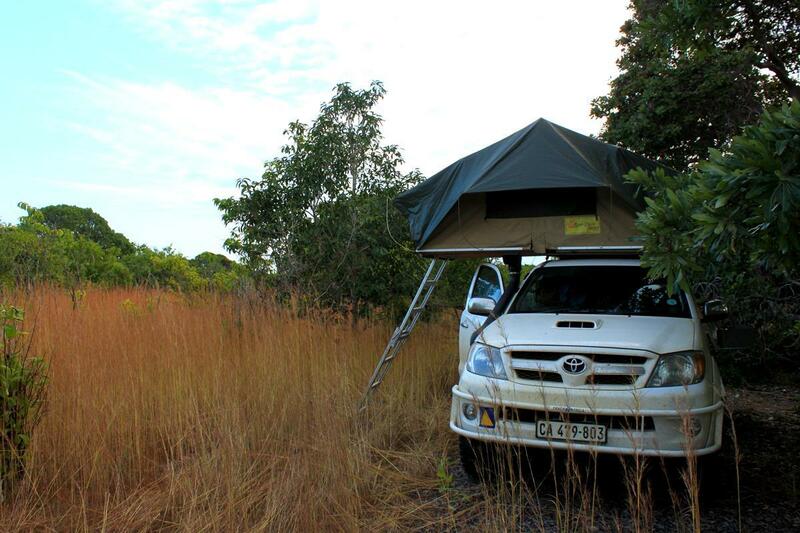 Bush camping gives you the freedom to travel as far as you want per day. 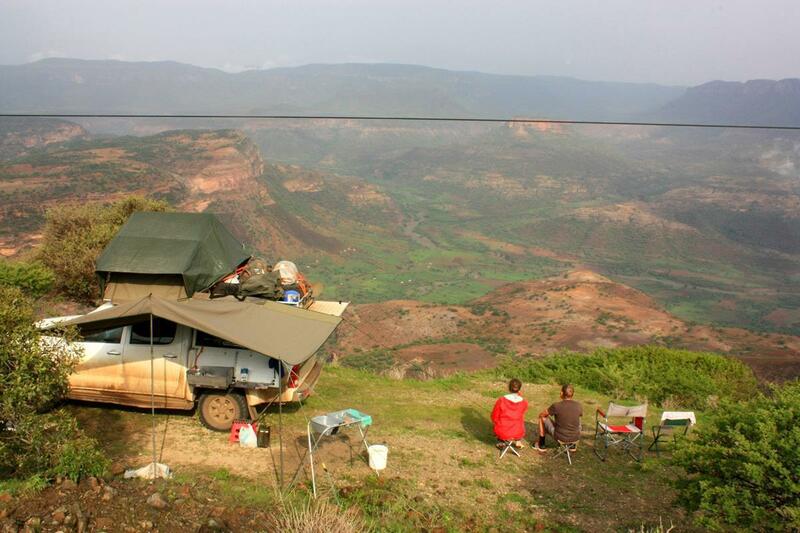 However, to bush camp you have to be smart in your choice of the site for safety reasons. Remember that threats will largely come from the human factor, hence the golden rule: if no one knows you are in a secluded spot, you should be safe. Never wild camp within sight and earshot of a road, path or near a village or other habitation. If you are in the bush with dangerous wild game and conditions permit you to safely make a fire, then clear an area, make your fire before dark and don’t stray from it or leave small children untended. Put the fire out properly before going to bed in a fully zipped-up tent where you will be safe, even from predators. Finding suitable bush camping spots takes a lot of thought and effort. 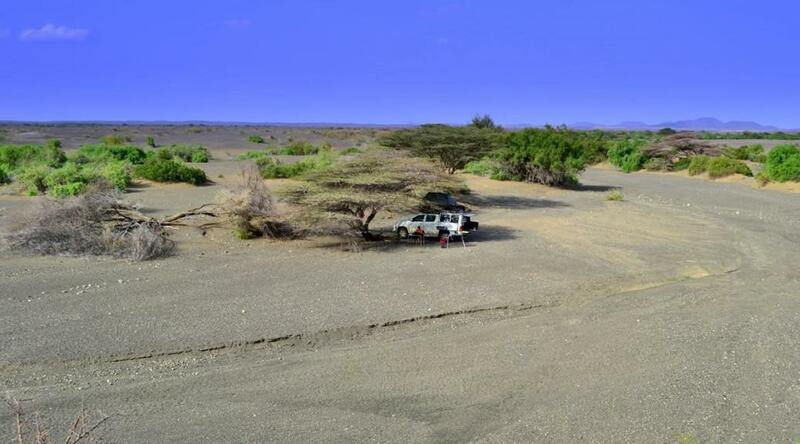 Driving along dry riverbeds provides privacy as they can screen you from view, being lower than the surrounding land. However, heavy rain in the catchment area could descend as a flash flood, so don’t camp on the lowest part of the riverbed and have an exit point available leading up to higher ground and safety. In the bush, drive along until you find an area that is unpopulated, which will be difficult in some areas. 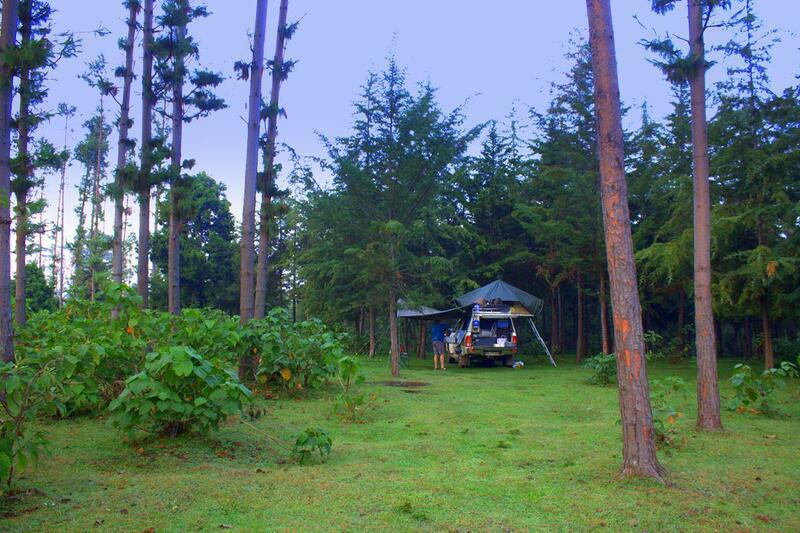 However, even in the most densely populated countries we have always found a bush campsite when needed. Mountainous ground, forests and rivers are fruitful possibilities. Once you come to such an area look for a point where the terrain is more or less level and it is possible to drive off the road, either on a track or through the bush itself. It is always nice to camp next to a river. Mark this point on the GPS and keep driving to make sure that the area ahead is clear of people for a kilometre or two. Then return to your waypoint and when no one is in sight, drive off the road, find your spot which should not be visible from any road or footpath and park as soon as possible. This minimises vehicle sound which travels a long way in the bush. Use subdued lighting at night. Your bush camping spot shouldn’t be visible from any road or path. 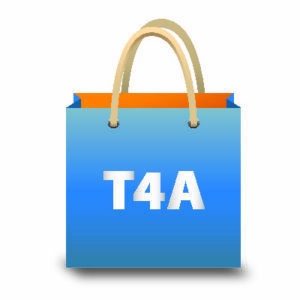 Remember that any footpath or track will probably be used in the course of your overnight stay, so make sure that you are well out of sight and earshot of these. If people keep passing the entry point to your intended site, drive off a few kilometres, cook up dinner and return around 20:00 when traffic will have reduced. Quite often there are roads running down to rivers where people collect water, wash vehicles and let their livestock drink. Investigate these during the late afternoon to see if they are out of sight of the road. These sites may be deserted after dark, when you can return, drive down and enjoy a peaceful spot. 98% of African people (even in South Africa) live with less every day. First world perspective! Adventure?